After Ellie shut down, Boyfriend and I have been trying to look for a new yummy laksa restaurant. We did end up finding a suitable version at Cafe D’Lite. 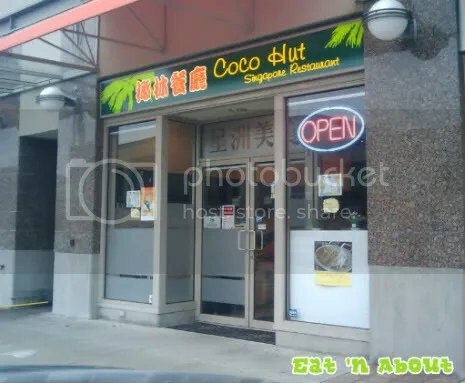 But one day on our way to Pho Thai Hoa, I caught a glimpse of a restaurant called Coco Hut. I got really excited as I had a hope that it’s probably the reincarnation of Ellie, so I made a mental note to go there. So I arranged lunch with F one day and we went there. 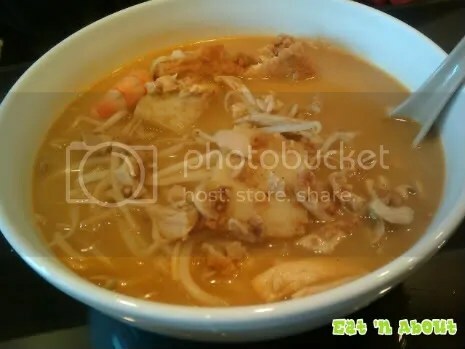 As I mentioned, it’s located in the same mall as Pho Thai Hoa and Ho Yuen. It’s a really small restaurant and when we went there, we were the only ones there. Perhaps we were early since by the time we finished there were 2 more parties in there. Here comes the tricky part. I ordered the Laksa while F ordered the Curry Noodles. When it arrived, they looked the same. I can’t tell you which picture is of which either. Last week, the weather in Vancouver became unbearingly hot (to me and Wendy!). Most homes in Vancouver are not equipped with air conditioners so that makes things worse than other locations elsewhere that receive more annual sunshine. Fans and A/Cs were being swept off shelves during these times. I couldn’t even go buy a fan for the office because the A/C *FAILED* when it was needed most. That leaves many of us Vancouverites heading to the mall to escape from the heat. This time, Aberdeen Centre saved us from the sunlight onslaught! We were in the mood for some Laksa and Cafe D’Lite was located right beside the busiest food court outlet in Aberdeen, Wo Fung. Since I hate lineups, I went to Cafe D’Lite instead. We observed and liked the fact that Cafe D’Lite places a cover on the dishes ready to be picked up. It’s a little thing but in my opinion, details go a long way. Furthermore, the lady at the cash was quite pleasant to deal with – in contrast to the folks at Wo Fung whom couldn’t buy a smile even if their lives were at peril. OMG. I’ve found the BEST LAKSA EVER (on this side of the world anyways…). This restaurant is actually decorated quite nicely. They have 4 large murals on the walls, and they’re weird, conceptual pictures which I don’t understand. I felt relatively clean in there, for an Asian restaurant. Service was prompt and courteous. We started with the Roti, because Boyfriend loves it. It was light and fluffy, slightly oily though. The curry sauce served with it had loads of flavor without being very spicy. However, I still like the version at Tropika more because there’s a slight sweetness to theirs. This was $3.50.